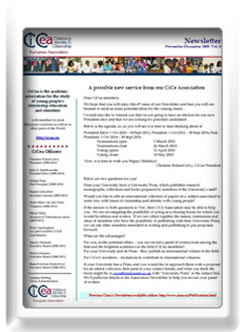 An electronic version of the 24th CiCea Newsletter (November - December 2012) was emailed to all members in January 2013. Association newsletters #20, 21, 22, 23 and 24 were published and emailed to all members. The 25th CiCea Newsletter is presently being compiled and will be electronically posted in early February. The original meeting site was changed due to scheduling problems. Therefore, the autumn Executive Committee/ Board of Directors Charity Trustees meeting was held in Patras Greece and hosted by the University of Patras. Among the topics discussed was the Research grant and a decision reached at the meeting was that the next call for the Research Grant will highlight that the grant's funding is only available for a set time. Also discussed was the issue of individual subscript rates with a view to reducing the number of bands and to be further discussed at a future meeting; improvements to the Association website and its Marketing Strategy. The spring meeting of the Executive meeting of the Executive Committee/Board of Directors/Charity Trustees was held in York prior to our Annual Conference. This was the last meeting as a member of the Board for Christine Roland-Lévy, who after many years was stepping down. 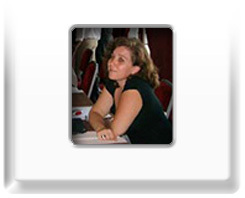 Sincere thanks were extended to her for her contributions to the Association. Highlighted by several announcements, our Annual General Assembly meeting was held on May 25th in York. We announced the confirmation/election results for Chris Gifford's confirmation as our Treasurer and Henry Maitles as our incoming President-elect. Also on the agenda was the announcement of the Annual CiCea Best Publication Award which went to: Andrew Mycock from the University of Huddersfield for his publication with his co-author Jonathan Tonge entitled "A Big Idea for the Big Society? The Advent of National Citizen Service", published in The Political Quarterly, 82(1): 56-66. Panagiota 'Titi' Papoulia-Tzelepi (Professor Emeritus of the University of Patras) was named this years recipient of the Annual CiCea Outstanding Achievement Award in recognition of her efforts on behalf of not only the Association but her dedication to supporting the precepts of children's rights, identity and citizenship. The Annual Executive Report was presented, proposed and seconded as was the Treasurer's Report. A CiCea Marketing Strategy Proposal was presented. Finally the "Executive Proposed and Approved Activities for 2012 were outlined. These activities focus on increasing the fundamental and applied research visibility of the Association. Among the activities was the establishment of a peer-reviewed online publication under the aegis of CiCea and to be located on the Association webpage, to which members can submit papers to be published. Elections were held for President. The person elected will serve a 6 year tiered term in office from October 2012 through to September 2018; 2 years as President-elect, 2 years as President and a final 2 year term in office as Past-President. Nominations opened in February, 2012. Nominations closed the 30th of March, 2012. Having completed the verification of submitted candidates' eligibility, electronic ballots were sent to individual and institutional members and votes were tabulated. The election results were announced at the Annual General Assembly meeting in May 2012 at York, with Henry Maitles accruing 91.6% of the valid ballots; Henry is our incoming President-elect. His term in the Presidency will run until September 30, 2018, 2 years as President-elect, 2 as President and 2 as Past President.